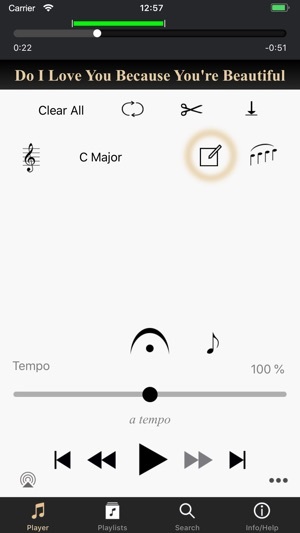 Appcompanist gives classical and musical theater singers and voice teachers full control over the world’s best accompaniment recordings, including tempo, key, melody, fermata and more. 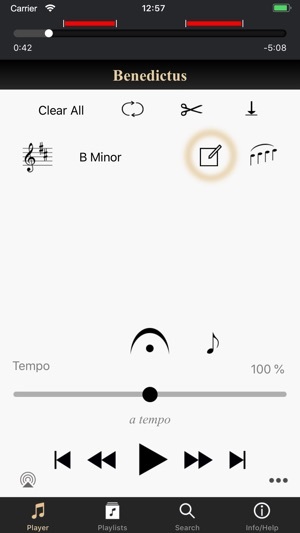 Appcompanist puts a level of control in your hand never before possible with recorded accompaniments. Transpose to any key; set any tempo; blend a melody guide track in and out in various octaves as piece plays; create additional rubato, fermatas of any length, ritardandos and accelerandos; set markers and create cuts and loop sections, all using simple on-screen motions that can be done with one hand while teaching or singing, and all without affecting musical quality. 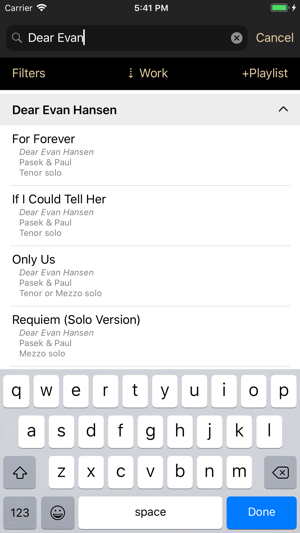 Top-level collaborative pianists from around the world are recording note perfect, singer-sensitive accompaniments for every aria, art song, and musical theater piece in the vocal repertoire for use in Appcompanist. Thousands of titles are already available and hundreds are added every month. Transpose instantly up or down 11 half-steps from the originally recorded key. Turn a melody guide track on or off any time during play, adjust the level of melody you hear against the full accompaniment, and choose to hear melody in one of three octaves. Hold and sustain the accompaniment, then bring it back in with perfect accuracy for musical pauses, cadenzas, recitatives, or other times in which a fermata is indicated. The fermata can also be used to start the piece when you're ready. Check next melody pitch when stopped and start in perfect sync with the accompaniment every time. Adjust tempo during play to suit any interpretation or set a new tempo with the tempo slider. Add markers, create cuts, and set loop sections. 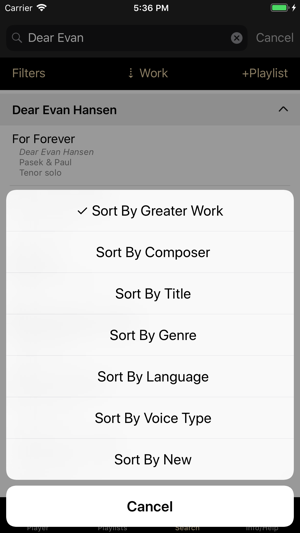 Filter and sort the library by genre, composer, language, voice type, greater work, title, and more to find the perfect piece. 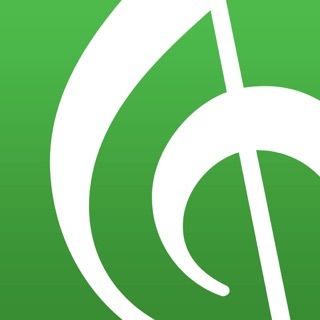 Create and edit playlists and share songs and playlists with other users. 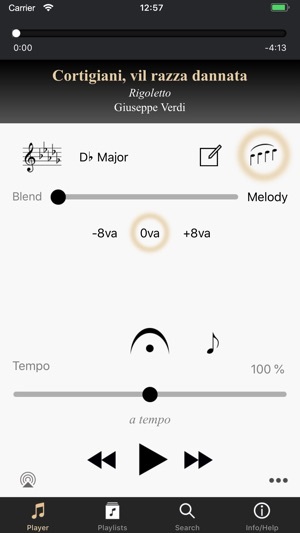 Create Custom Versions that can be controlled just like the original accompaniment. All recordings are played by the some of the world’s top collaborative pianists and coaches. Note: All prices shown are in US dollars. Prices in the app will reflect current exchange rates from US Dollars to your local currency. • All of the above subscriptions come with a 7-day free trial: If you cancel for any reason within that period you will not be charged. If you continue, your paid subscription begins at the end of your free trial. Pick any 6 songs from the Complete Collection and access them as often as you like during your monthly term. You may change any or all of your selections at the beginning of each new monthly term. You can have a maximum of 6 selected songs during any monthly billing period. I have been having so much fun singing with Appcompanist, it has helped renewed my joy in singing and my willingness to practice. Knowing that I have all the accompaniment for my songs PLUS melody track if needed, is awesome. Being able to change keys and tempo INSTANTLY is so cool and helpful. I am still learning how to use the fermata button, but I think it is so great that the feature is there. The catalogue of songs is extensive (opera art song, musicals, etc) and I emailed the developers to get some spirituals added particularly those by Moses Hogan. They were super responsive and helpful and they said they would prioritize adding those songs. 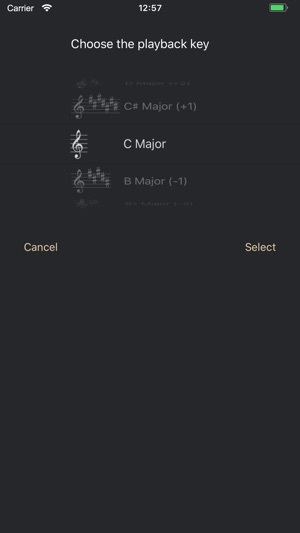 The app sits on my iPhone, but once I connect my phone to an external speaker, it sounds like I have a pianist right in the room! I have been practicing with the app and I plan to perform with it this Sunday (10/29). I have been looking for something like this for a long time. Check it out, it rocks! Woo hoo!! Admittedly I was on the fence due to the app not containing a good portion of recital rep that I needed. After an email exchange with the developers, I’m glad I decided to give it a chance. 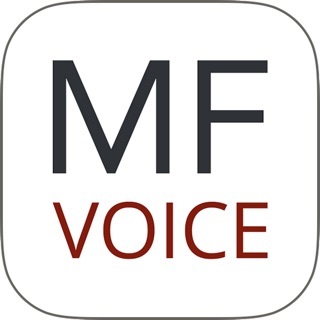 This app is fantastic and works as advertised, and is a perfect rehearsal tool for those of us that are keyboard challenged. In addition, I requested a number of songs be added a few weeks ago. I received notification from the app that new songs were added, and it was half of the songs I listed. Immediately after, I get an email from the developers telling me that they were added and that the rest of my requests would be taken care of within the week. AMAZING customer service, and worth every penny.